Mix together and store in an air tight container...especially with summer coming up. Put ice into glass, and add vodka. 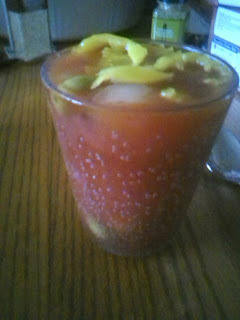 Put in tobasco and worchesterire sauce, celery salt, and clamato. A special Thank you to Emily and Megan for the sharing of their recipes. I don't know where I would be without the two of you and your AMAZING yummy recipes. 1 c shredded cheese, reserved. In a 1 gallon freezer bag, place cooked rice. In a bowl mix taco seasoning & tomato sauce. Add chicken and coat well. Add to bag and freeze. After thawing: place rice and chicken mixture into a 9x13 pan and frost the refried beans over the top. Top with shredded cheese. Bake at 350 for 30-45 minutes. For this recipe I just 'dumped' all the ingredients into a bag and threw it in the freezer. I will thaw the mixture, and then use it to fill tortilla shells. I will then place them in a baking dish and cover with enchilada sauce and top with cheese and bake until heated through. 1 lb cooked, bubed chicken. In bowl, combine beaten eggs, ricotta cheese and TWO cups of the mozzarella cheese and parmesan. If you choose not to use the parmesan, just add more mozzarella. In a 13X9X3 pan, spread 1 cup of sauce on bottom of pan. Layer in the order, 4 uncooked lasagna noodles (they will overlap), then 1/3 part of the ricotta cheese mixture, half the browned meat, 1 cup mozzarella cheese, and 1 cup of spaghetti sauce. Next layer, 4 uncooked lasagna noodles, 1/3 part of the ricotta cheese mixture, and 1 1/2 c. sauce. Next layer, 4 uncooked lasagna noodles, remaining ricotta mixture and remained meat, 1 cup of sauce. For top layer, 4 uncooked lasagna noodles, remaining sauce, and remaining 1 cup mozzarella. Bake covered with foil for 50-60 minutes. Canned corn, drained 15 oz. Canned creamed corn 15 oz. In a large bowl, add the muffin mix, sour cream, corn, creamed corn, egg, margarine and cheddar cheese. Stir by hand until thoroughly mixed. To Serve: Thaw bag overnight in the refrigerator. Pour into a greased 1.5 quart casserole dish, or a greased 8x8 pan. Bake at 350 degrees for 1 hour. To test for doneness, a knife inserted in the center should come out wet, but clean. Serve hot. In a large bowl, wisk egg and milk. Stir in the cheese, oats, onion, carrots and salt. Crumble beef over mixture and mix well. Shape into 8 loaves. Place in a 9x13 baking dish coated with cooking spray. In a small bowl, combine ketchup, brown sugar and mustard. Spoon over loaves and freeze I personally store the ground meat mixture in a freezer bag rather than splitting it right away... it works better for my family this way. I rarely make the 'sauce' until the night I am making the meatloaves. I almost forgot, I also added corn. I filled a cereal bowl and nuked the corn to warm it - them mixed it in. Cook onion in 2 T butter until soft. In a pan mix butter and flour. Stir in onion, half and half and chicken broth. Stir 5 min or so until thick. Stir in Tabasco, chili powder, cumin, salt and pepper. Add beans, chilies, chicken and cheese. Cook over low heat 20 min. Stir in sour cream and serve.